On Friday we will be celebrating Palm Sunday in the topsy-turvy way of church in Egypt! 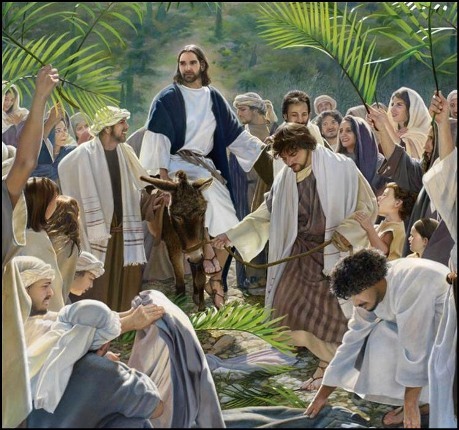 We remember Jesus’ triumphal entry into Jerusalem with the crowds crying “hosanna!” How easy it is to cheer a popular leader when they are ahead – and how quickly the popular mood can change. Many times over the last year in Egypt, we have seen how quickly public sentiment can change. People’s views and their support for leaders is always changing and yet we know that we have a God who does not change – a God who is with us during our personal “Palm Sundays”, our personal “Good Fridays” and our Personal “Easter Days”! Whatever is happening around us or within, God is the same yesterday, today and forever! We will meet together over the Easter Weekend at 10am on Good Friday and Easter Sunday, with the Easter Day service followed by a potluck brunch! We are also invited to join with the Cairo Christian Fellowship at 6:30pm in the Guild Hall for their Easter Cantata. In practical preparation for Easter we have a church cleaning day beginning at 10am this Saturday, 31st March. All welcome to come and clean!!! StARS have their end of term concert this Tuesday and video of the event will be available on the website soon after. Remember, you can make a donation to StARS via our website or via the StARS website, www.standrewsrefugeeservices.org. See Gloria to purchase Easter Lilies to decorate the church on Easter Sunday. We will have a church cleaning day this Saturday, 31st March, beginning at 10 am. The Anafora Easter retreat has been cancelled – we will try to go later in the year. Skype prayer meetings will restart after Easter on Tuesday 17th April at 7pm. Add “iainbaxter” as a skype contact to join in.